The end of summer always gets me super excited as my Transeasonal inspiration becomes reality and I finally get to pair my summer florals with cooler layers and winter boots! This combination is a staple come Autumn, and this year I'm on the hunt for more knee high boots to add to my collection. Searching over the internet I've found so great styles and great prices but the website that's helped me the most has to be Fashion Lane. I found links and images to the brands I love and discounts via this website and with one click I found so many boots for my lust list. 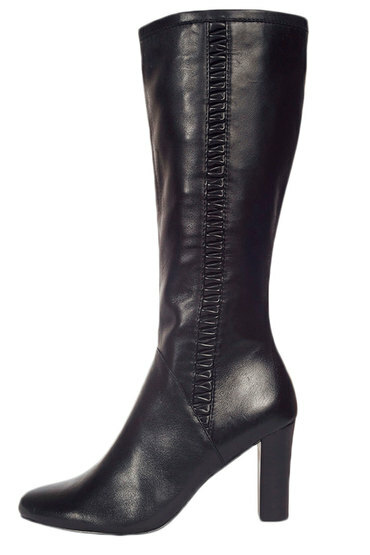 A classic black leather boot with a medium heel and the most delicious embossed pattern on each side. Every girl needs a classic black boot and this style will take you through both Autumn and Winter. These will pair perfectly with all my summer wrap dresses, black floral frocks and skirts and with printed stockings when the cold hits. 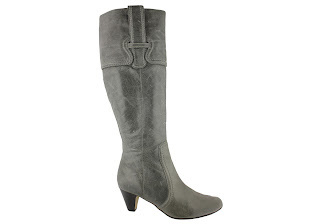 Lastly a grey boot inspired by a vintage cowboy boot I have in my collection. I never even glanced at grey shoes prior to owning my cowboy boots but now they have sparked an obsession. With a small heel for day wear, and a western style top these will be a great addition to my collection. Now to make some room in my wardrobe as I've got so many shoes I'm running out of space! Oh the joys of being a addicted to footwear.